It’s official. British actor David Oyelowo (pronounced oh-yellow-oh) is a bona fide star. He’s an actor whom viewers have been seeing over the last 15 years, but they may not have been able to put a name to his face, as we say in the United States. That’s about to change with Oyelowo’s portrayal of the iconic civil rights activist Martin Luther King Jr., in the highly anticipated film Selma, directed by indie darling and game changer Ava DuVernay, director of I Will Follow and Middle of Nowhere. Oyelowo, who recently received a Golden Globe nomination, has been busy building an impressive acting résumé and career that spans the globe. The actor, who was born in the United Kingdom to Nigerian parents, trained at the London Academy of Music and Dramatic Art. He starred in the BAFTA Award-winning BBC series MI-5 (known as Spooks in the U.K.), the British TV drama Five Days, ABC’s production of A Raisin in the Sun, the theatrical release As You Like It and HBO’s No. 1 Ladies Detective Agency. He also guest-starred on CBS’ The Good Wife. His television success is underscored by a prolific film career, which includes roles in major motion productions like The Last King of Scotland, The Rise of the Planet of the Apes, The Help, Lincoln, Red Tails, The Paper Boy, Jack Reacher, Lee Daniels’ The Butler and Interstellar. Oyelowo has had the privilege of working with the likes of filmmakers George Lucas and Christopher Nolan and starring opposite Daniel Day-Lewis, Audra McDonald, Forest Whitaker, Tom Cruise and Carmen Ejogo, among others. He takes it all in stride, carefully and intentionally choosing roles that add value to the entertainment landscape. It is this approach to his craft that led Oyelowo to DuVernay, with whom he previously worked on the critically acclaimed Middle of Nowhere, which won DuVernay a best director award at Sundance—a first for an African American. Oyelowo, who works on both blockbuster films and small independent films, is always looking for a powerful script and great experiences like the one with DuVernay on Middle of Nowhere and now Selma; indeed, he helped bring her to the latest project. 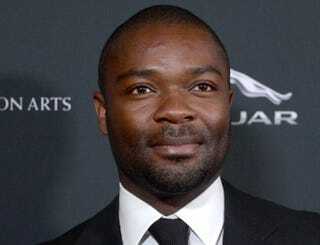 Raised primarily in the U.K., Oyelowo spent seven years in Nigeria and now lives in the U.S. He understands what it means to be a “black person on planet Earth.” Oyelowo understands the nuances of racism and how it differs on the different continents. Although racism is prevalent in the U.K., class plays a major role in how it manifests in that country, he says. “Especially as a black man in America, you are dealing with proving, again and again, your manhood. The difference with Nigeria and here, I find, is that you will have a homeless guy in Nigeria and you can’t tell him he’s not a king, but here you can see a basketball player who’s earning a lot of money, and he’s having to fight for his dignity, despite being a millionaire, and to fight for his identity, his manhood, his kingship and crown,” says Oyelowo, who is also a 2013 Independent Spirit Award winner. His journey as an actor is still unfolding, and he is committed to making great films and learning from them. Oyelowo offers, “The Bible says, ‘Greater love hath no man than to lay his life down for his friend.’ It’s one thing to say that, and it’s another thing to live that, so that was the thing that I walked away with. There’s a difference between the talkers and the doers.” Clearly a doer, Oyelowo plans to keep making films that matter and make a difference in the world.